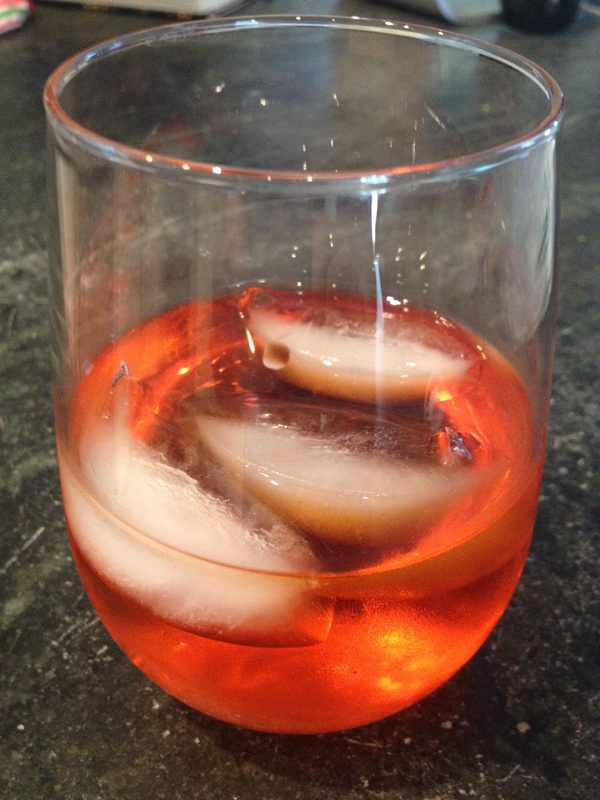 As some of you may know, the European Soccer Championship is underway and ITALIA is one of the contenders. You must know that every time the AZZURRI (nickname for the Italian soccer team) play in a competition, it is a serious matter in my house. As game time approaches, the air gets tense, My three men pretend to be relaxed but you can just sense how jittery they are. As for myself, no reason to deny that I get very anxious as well; lately, however, I realized that spending the hours leading up to the game cooking, put me at ease and so . . . I cook! Yesterday, ITALIA played vs. England for a chance to advance to the semifinals, big game, a lot at stake, game time 2:45 PM . . . plenty of time for me to release the tension in my cucina. 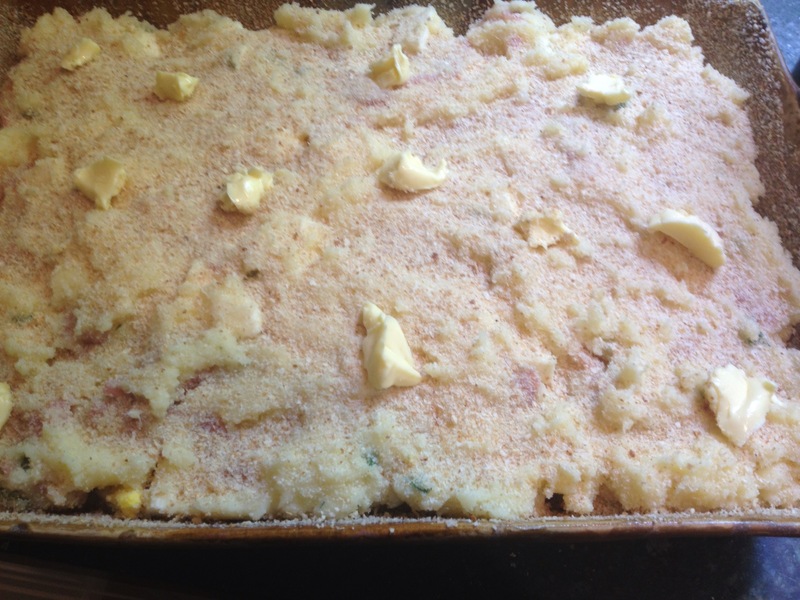 I decided to prepare something that my mom used to make and that it also happens to be one of my favorites: Gattò di patate. 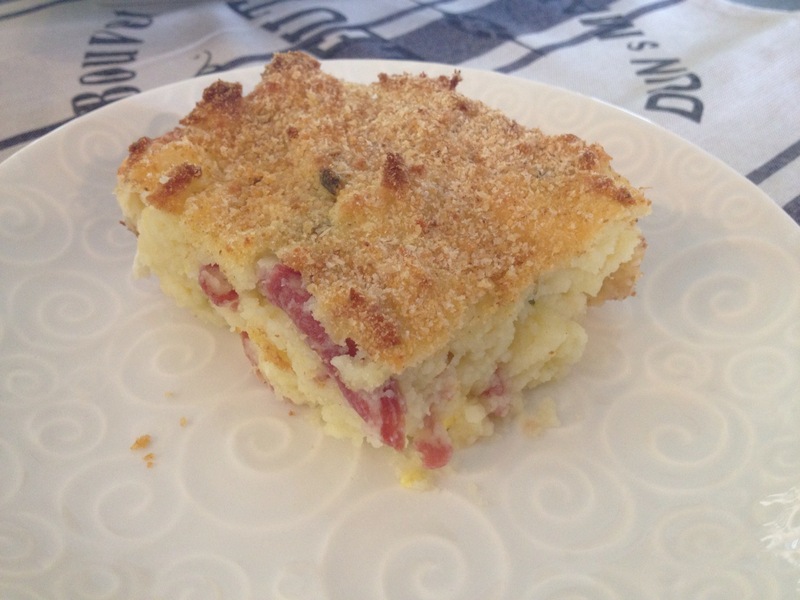 This is yet another classic of the Neapolitan cuisine, perfect for sharing, great for picnic and to me a very festive dish. 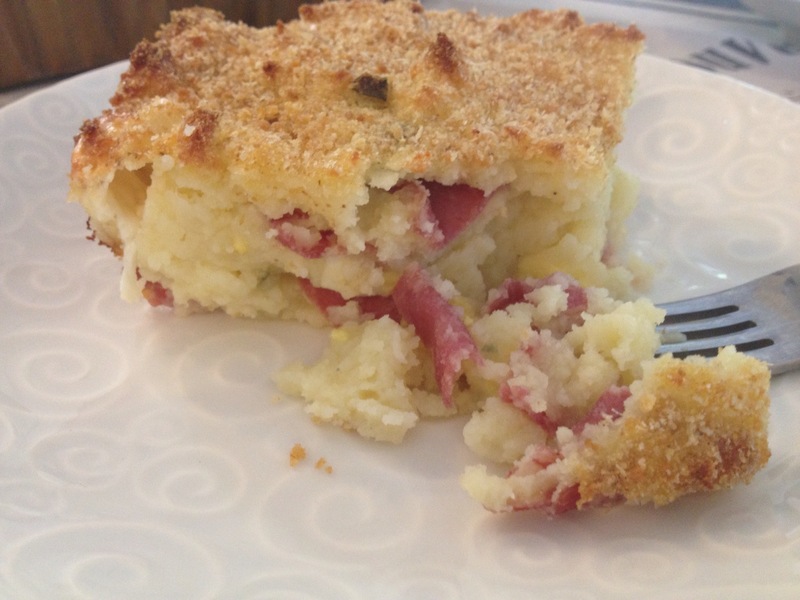 It’s a sort of stuffed mashed potatoes casserole; this description doesn’t really give justice to the dish, so just trust me when I say that “il gattò” is divine and you will love it. I will be honest and say that it takes some prep time, but it’s worthwhile. Since I had a lot of time on hand before the game, while the potatoes were boiling I got started on my dessert: “Semifreddo al caffe and mascarpone-zenzero” (Coffee and mascarpone-ginger semifreddo). I had never made a semifreddo before and I am super excited with the result; I will let you get a glimpse of my faboluos sweet treat but you will have to be patient and come back in a day or two for the recipe . . . sorry! 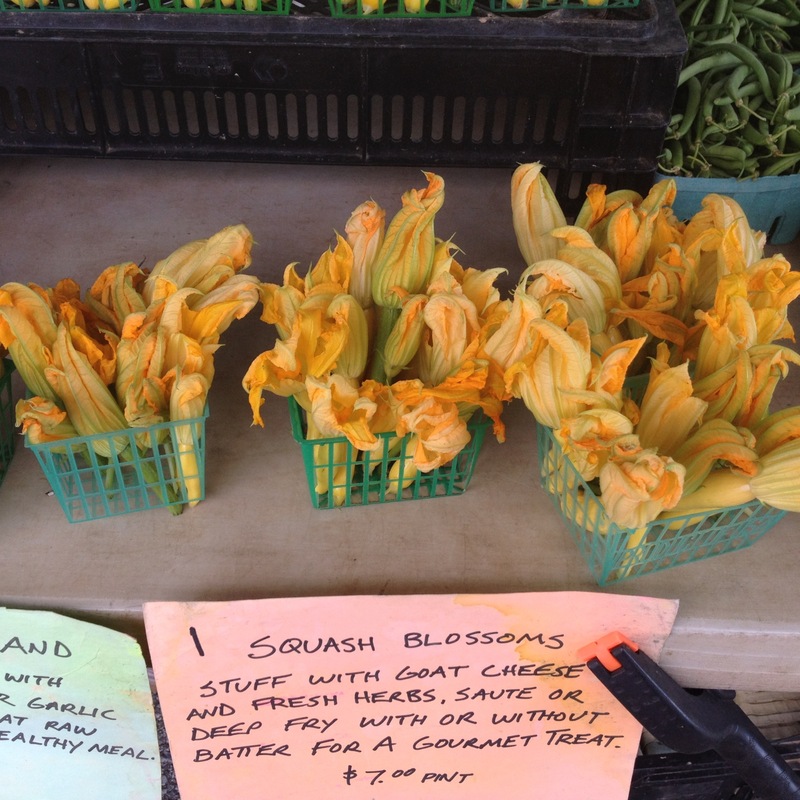 Still some time to spare… Saturday morning I had visited the local farmers market where I found squash blossoms, I love them! 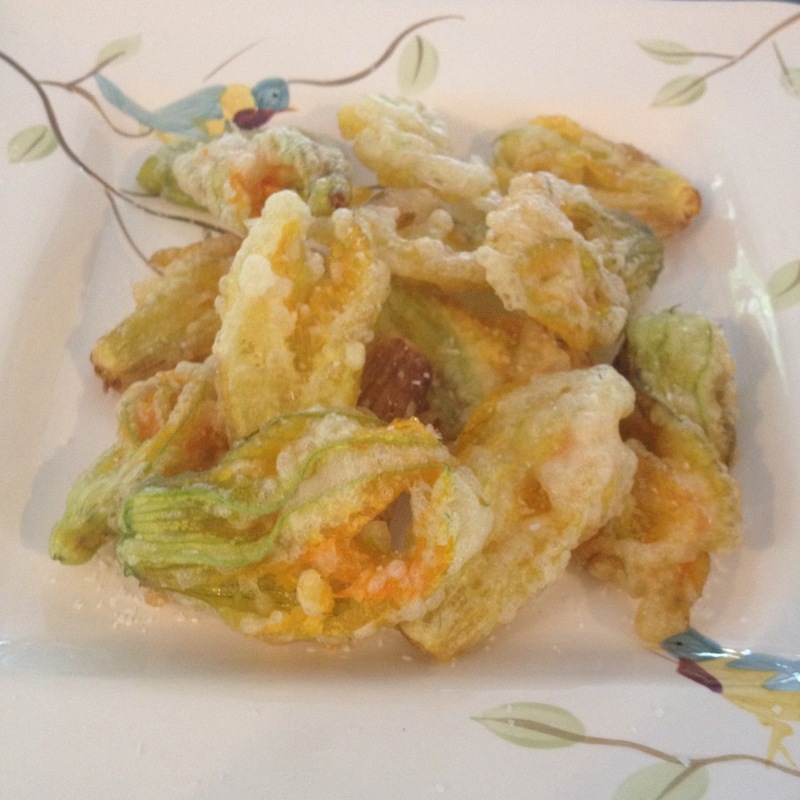 I thought I could quickly fry them so we could have a crispy bite during warm up. It’s kick off time . . . FORZA ITALIA! Half time, still 0-0 . . . let’s calm down with a slice of gattò. Regulation time is over, final score 0-0 and going to overtime . . . let’s have some more gattò. Overtime is gone, still 0-0 going to PENALTY KICKS . . . I hate PKs and there is no more gattò. I can’t watch, time for me to retrieve in my bedroom, bite my nails and wait for the yelling and hopefully cheering downstairs . 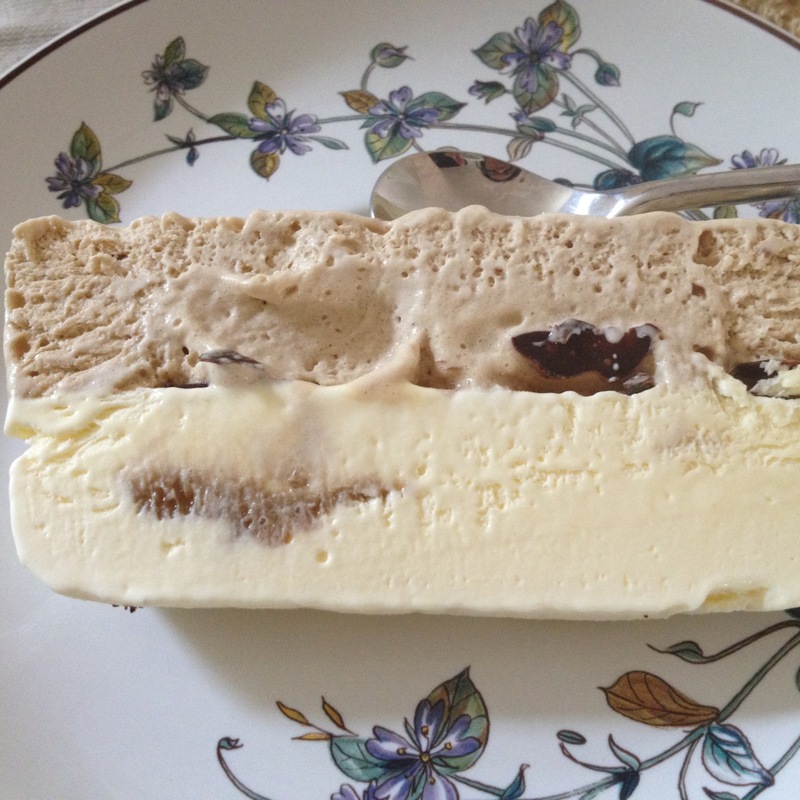 . .
Let’s celebrate with my semifreddo. That’s it until Thursday, semifinal game vs. Germany at 2:45 PM . . . more fun in my cucina. Boil the potatoes with the skin. They should boil for approximatley 45 minutes. Test with a cake tester and make sure they are tender. 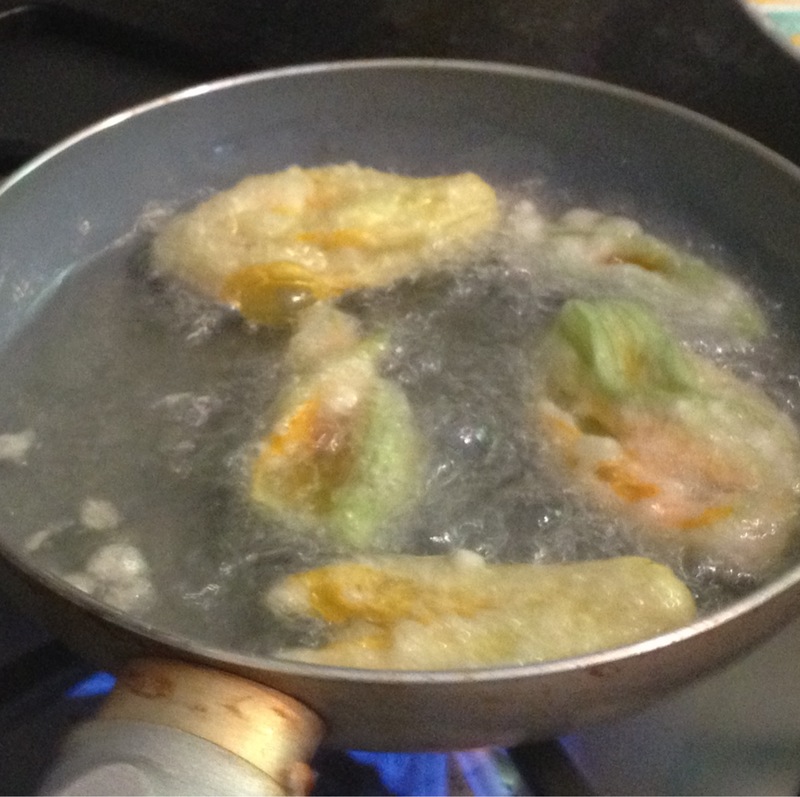 While they are still hot, peel them and pass through a ricer letting them fall into a large bowl. It’s now time to get your hands dirty . 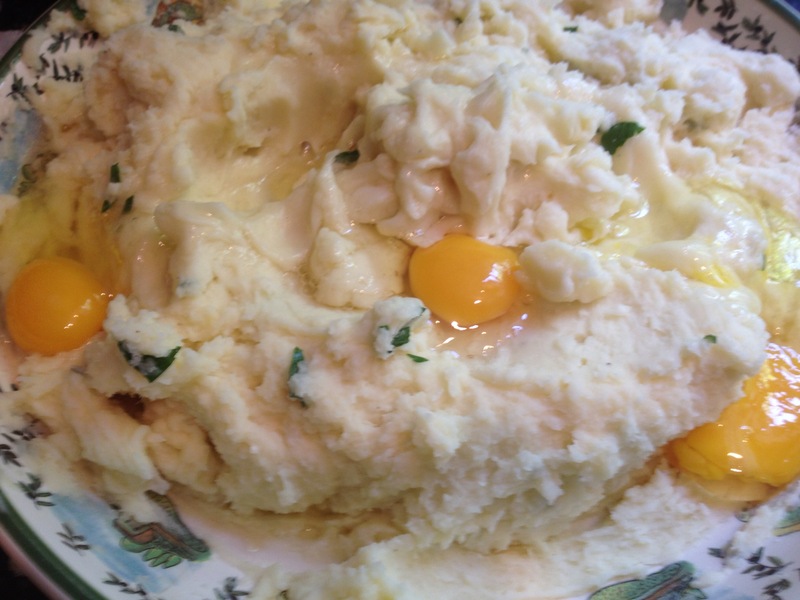 . . Add butter (reserve 2 tablespoon) and work with your hands until the butter is melted and incorporated into the mashed potatoes. 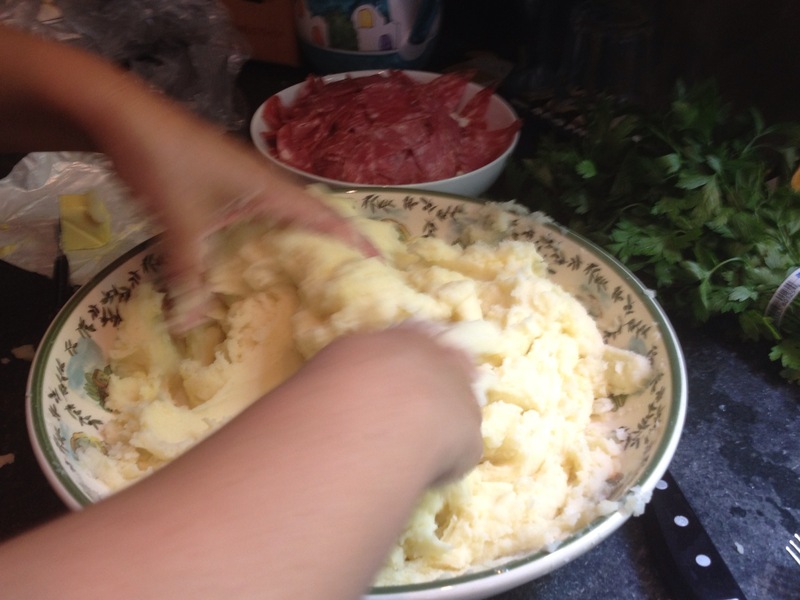 Add the grated cheese, parsley, salt and pepper. Keep mixing with your hands. 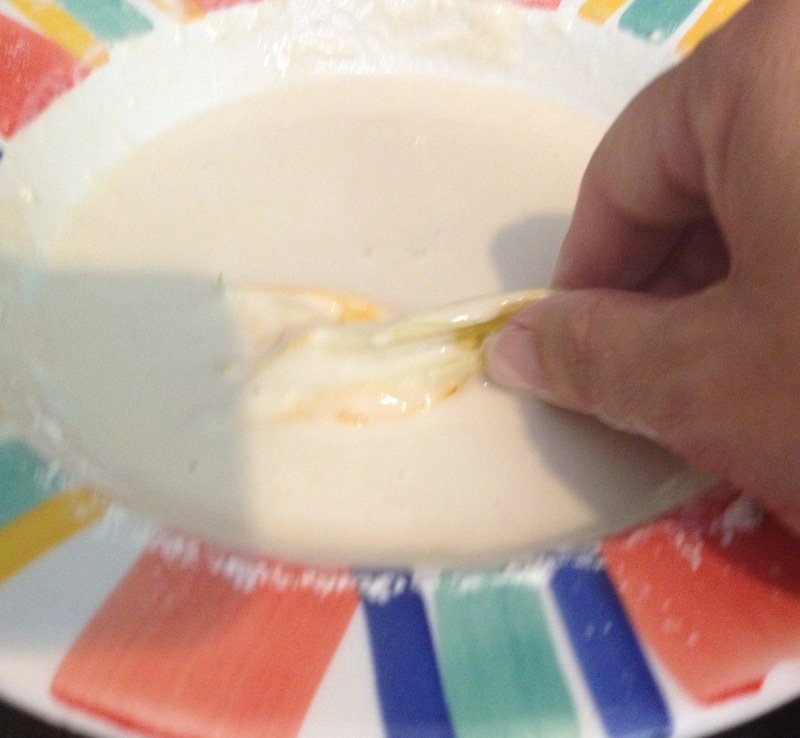 Add the 3 eggs and keep working, if the mixture seems too dry, add some milk to soften. 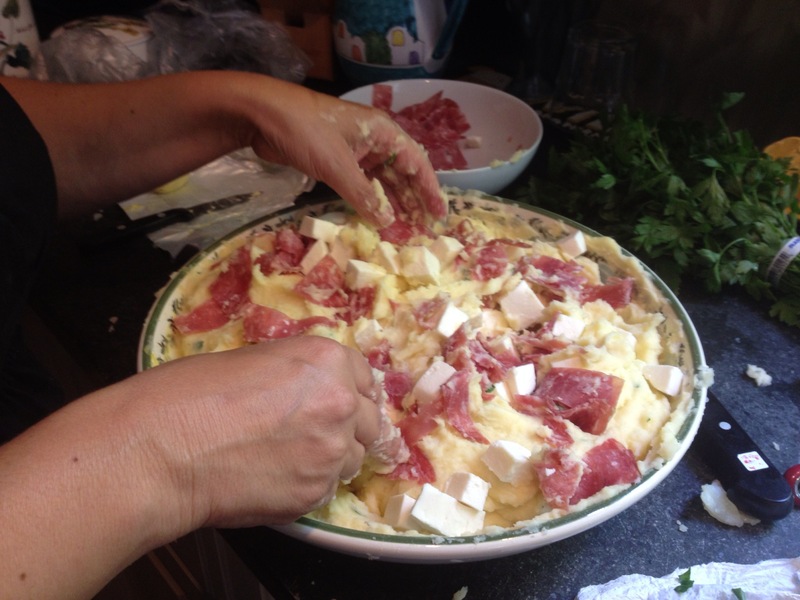 Add the strips of salame and the cubed mozzarella and with your hands work the mixture so that all the ingredients are blended together. 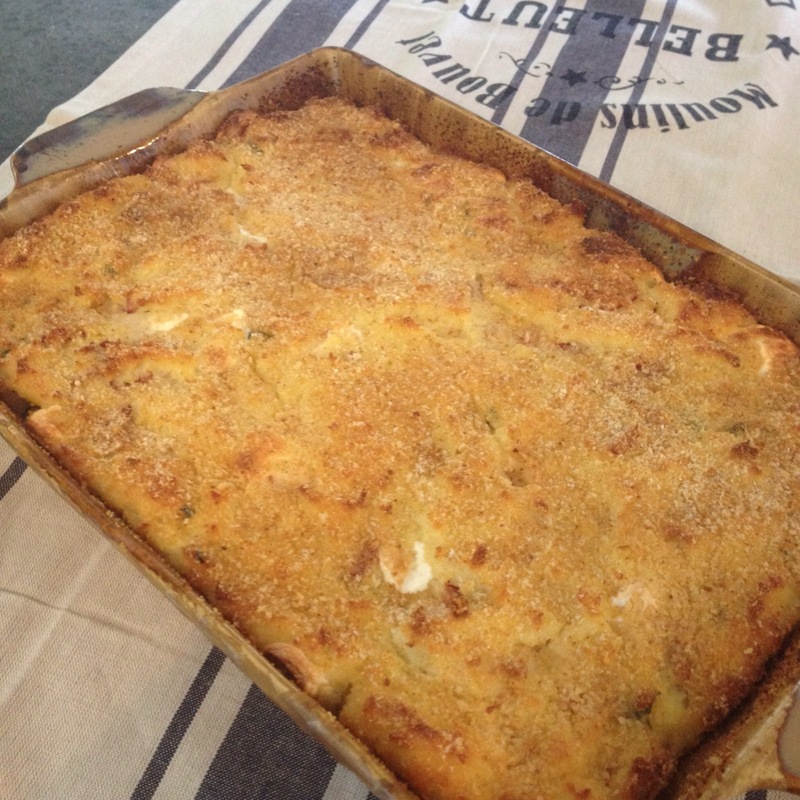 Butter a baking dish (I like to use a medium size with taller edges) and sprinkle with bread crumbs. 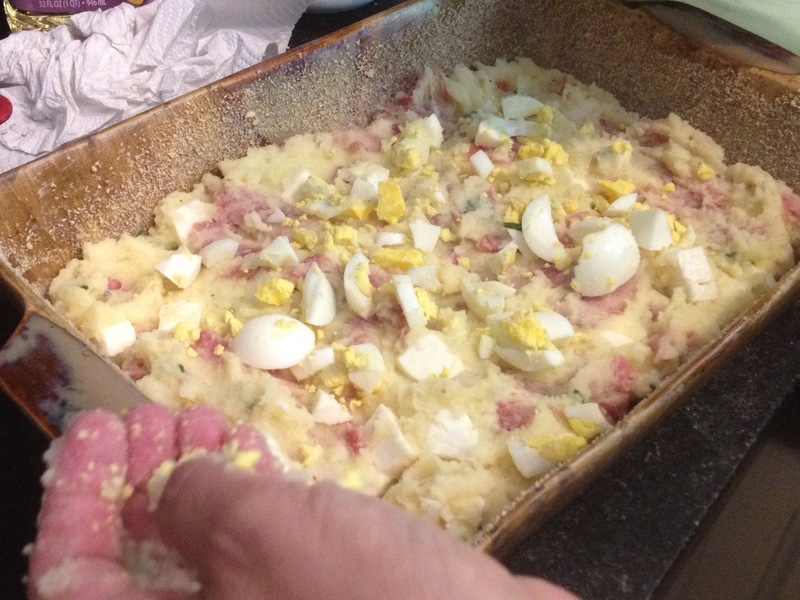 Arrange a layer of the potatoes mixture into the baking dish, cover with chopped hard boiled eggs and grated cheese. Add grated cheese. 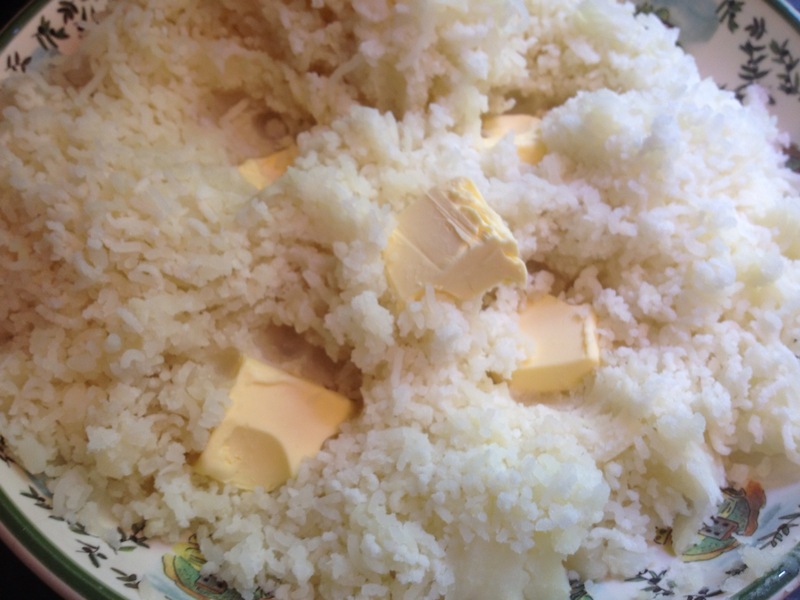 Finally top with bread crumbs and dot with small pieces of butter. Bake in preheated oven at 400 degrees for one hour or until the top is golden-brown and crunchy. Let rest at least 15-20 minutes before plating. THE FIRST BITE . . . SOOOO GOOD!!! Don’t forget to come back, until then . . . FORZA AZZURRI!!! This looks amazing and pretty simple too! The first glance of the photo reminded me of our easter pizza just a little bit. Would love to try this with my mom!! Thanx for the recipe!! Yes, it is simple. It only requires a little prep time but it is so good. And you can prepare it in advance which is great. I think your mom and yourself would have fun making it. Let me know! This looks SO good!! Have you ever made it with proscuitto? I have some in the fridge and thought just maybe that might work. What do you think? I saw the article on http://www.ItalianNotebook.com and it was crazy to see the celebration. Very exciting stuff! Prosciutto would be perfect and also mortadella. I usually use one the three. Let me know how it comes out … I think you will like it.